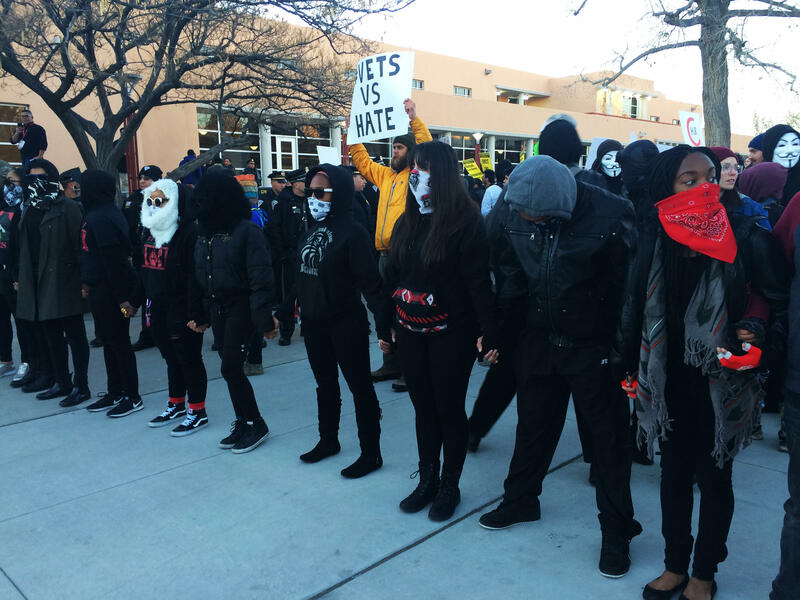 Despite the harsh cold and the setting sun, hundreds turned out to stand against Yiannopoulos’ presence at the University of New Mexico. The Student Union Building had been emptied for the event, along with the campus libraries and more. State Police officers in riot gear looked down on the crowd. Yiannopoulos is an editor at the Breitbart website and is associated with the so-called “alt-right,” a white nationalist movement. Ph.D. student Carlyn Pinkins said his visit makes UNM a more dangerous place for LGBTQ students and people of color. "It’s really a shame that people who are just voicing their opinions are met with such visual aggression as opposed to people’s whose ideas spread violence," she said. 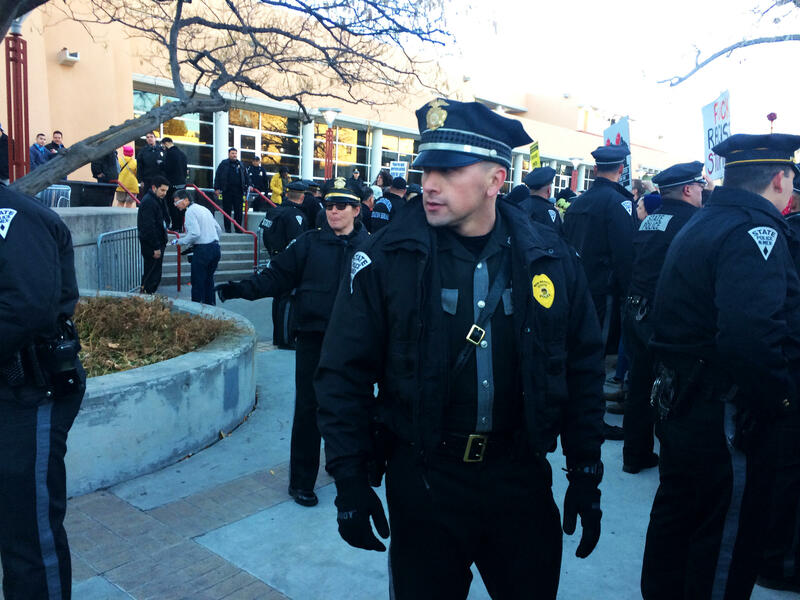 Watching the tense demonstration as choppers circled above was an emotional experience for UNM staffer Miryam Miller. "It’s really hard for me because I’m really old, and I thought we were done with this," she said. "And I can’t believe that this level of ugliness is happening in my lifetime." Samantha Garcia said she came in solidarity with other students to oppose the normalization of this kind of rhetoric. "The danger of hate speech, we’ve seen it throughout history," she said. "All the genocide that it’s caused, all the xenophobia. I think we all know what hate speech has done. We just need to go back to history a few decades." Inside the ballroom, around 500 people waited in their seats as the text of UNM’s student code of conduct loomed, projected onto two large screens. Protesters outside started banging on locked exterior doors leading to the ballroom. 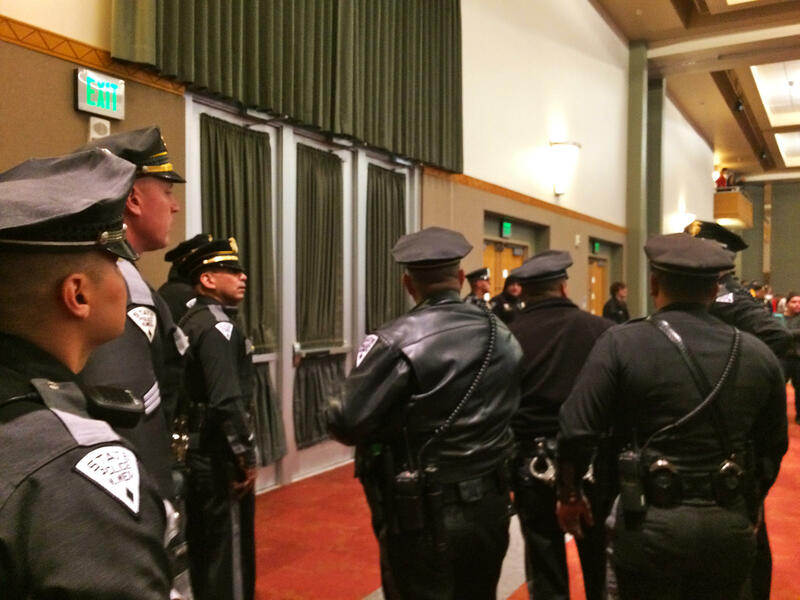 Uniformed officers clustered around the doors and looked on in alarm. Then the crowd inside started chanting "USA! USA!" Police cluster around doors that are being banged on by protesters. Yiannopoulos entered to big applause. He talked about closing U.S. borders. He showed hand-drawn caricatures of Mexicans at a border fence. 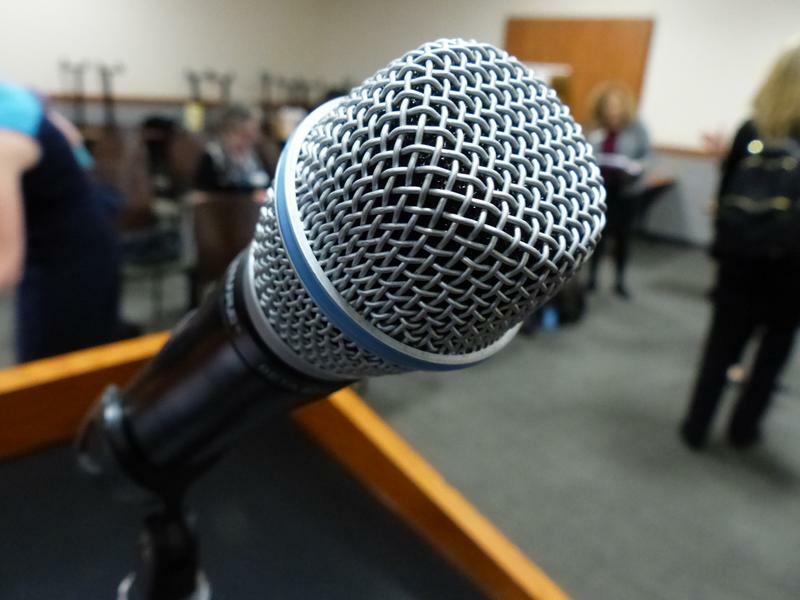 He flashed the phone number for Immigration and Customs Enforcement and urged the audience to report people they thought were in the U.S. illegally. "And here’s a sort of dirty secret I would like to reveal to you Americans: Hispanics are white. I’m sorry to break it to you," he said. "Progressives in your country have done this weird job of breaking everyone down into categories." A racially diverse group of people identify as Hispanic all over the world, according to most population studies. Yiannopoulos said calling people racist was a divisive liberal tactic. He showed an image of a woman in an American flag hijab and said Muslim values are not in line with American values. A couple of women in the audience objected. 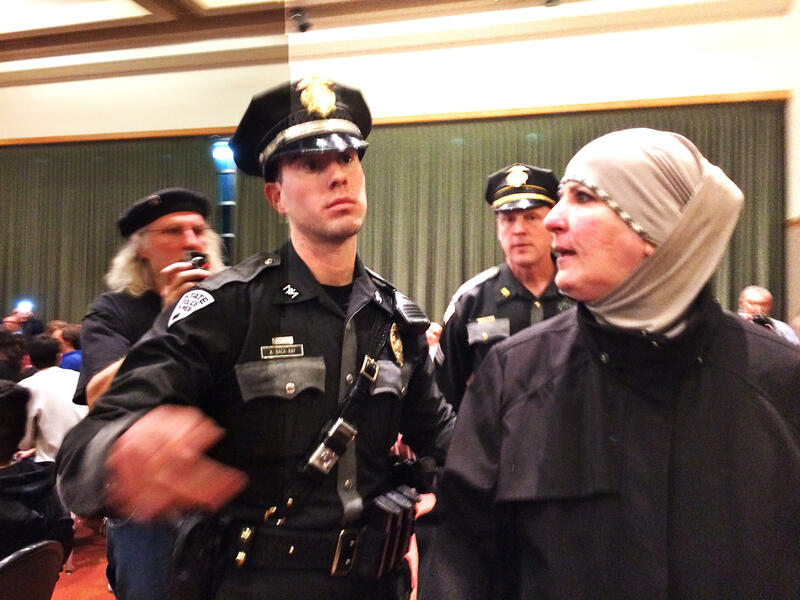 Yiannopoulos responded: "You’re wearing a hijab in the United States of America. What is wrong with you?" There was a roar of approval. Dissenters were escorted from the building by armed police officers. A woman is escorted out of the event. Tatiana Allensworth said Yiannopoulos was an exciting, if sometimes crude, speaker. She said she’s a first-generation American whose family waited years for the opportunity to come to the U.S. from Cuba legally, and that people need to bother with filling out the right paperwork to live here. "If you’re going to come to the country, at least come to the country and try to be a citizen," she said. Gary Koler said he likes that Yiannopoulos supports the Trump presidency. "He says it like it is, and he says it in a way that it’s extremely entertaining," he said. "I’m with him on all our little precious fragile snowflakes on campus, which I think is absolutely insane." Precious snowflakes, Koler clarified, are people who don't want their feelings hurt. The Southern Poverty Law Center reports that the rate of hateful harassment has been rising since Election Day, though it’s dropping off now. Anti-immigrant incidents are the most common. 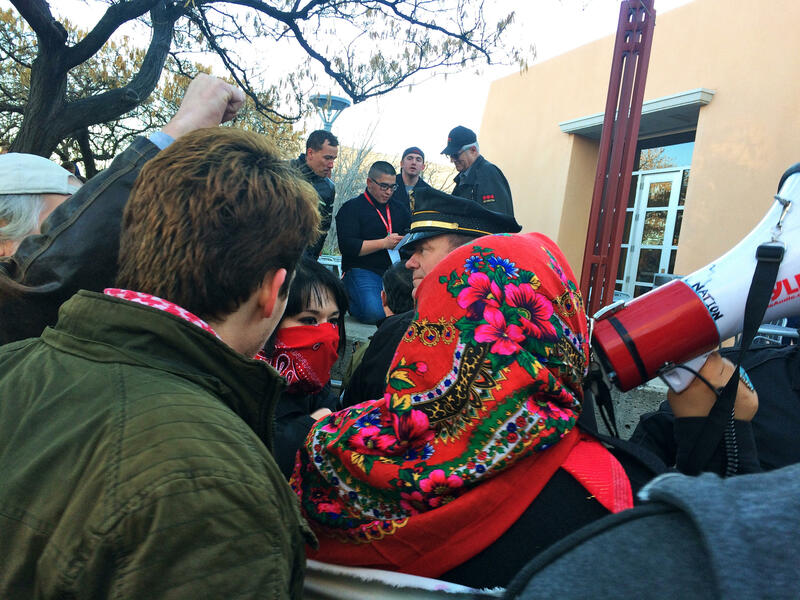 Over the course of the evening, five objectors were arrested, according to UNM Police.